A list of Pokémon you can ride around on in Pokémon: Let's Go. In Pokémon: Let’s Go, Eevee and Pikachu, you'll encounter a variety of rideable Pokémon. As expected, only a select few Pokémon can be ridden on, and the type of terrain you can ride them on varies depending on their type. Aside from looking cool and fitting in with the vibe of the Pokémon movies and TV shows, is there a purpose to riding on Pokémon in Pokémon: Let’s Go? To answer this question and more, read on to view the list of all rideable Pokémon in Pokémon: Let’s Go, Eevee and Pikachu! 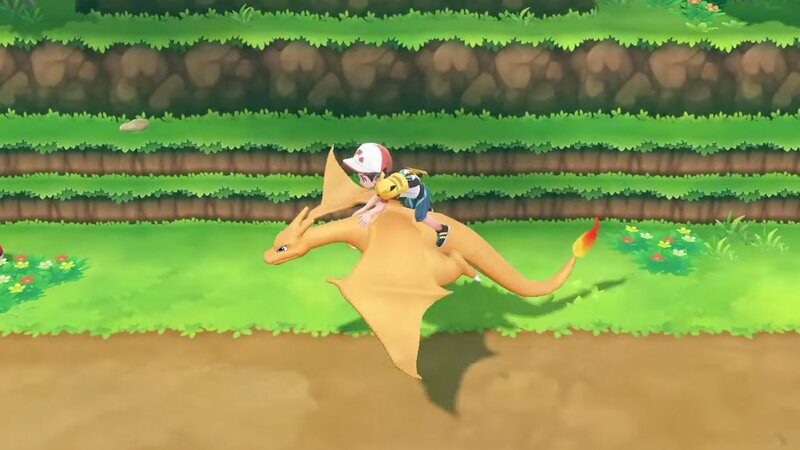 There are 18 rideable Pokémon including Charizard in Pokémon: Let's Go. In Pokémon: Let’s Go, there are 18 rideable Pokémon and the terrain you can ride them across varies based on their type. The functionality of riding Pokémon works in a similar fashion to the Bicycle in previous games by giving you a slight speed boost. It can also be used in conjunction with Special Techniques like Sea Skim if you have a Pokémon like Lapras. As of right now, there are 18 different rideable Pokémon in Pokémon: Let’s Go, Eevee and Pikachu. In the future, more rideable Pokémon may be added. Most of the rideable Pokémon can be used on land or (slightly) in the air, though two can be ridden across watery terrain (like the aforementioned Lapras). Below, you’ll find a list of 18 rideable Pokémon in Pokémon: Let’s Go, Eevee and Pikachu (list courtesy of Twitter user mattyoukhana_). As you probably noticed, Gyarados and Lapras are the only rideable Pokémon that can be used alongside Sea Skim. In the future, it’s possible that new rideable Pokémon may be added at a later date, and the way rideable Pokémon work may change. Until then, keep an eye out for the 18 rideable Pokémon in Pokémon: Let’s Go, Eevee and Pikachu. Not only are they a fun way to get around, they can also be quite useful, especially Gyarados and Lapras if you want to use Sea Skim in style! So, which rideable Pokémon is your favorite in Pokémon: Let's Go? Let us know down in the comments below! For more on Pokémon: Let's Go, be sure to check out some of our previous guides including how to transfer Pokémon from Pokémon GO to Pokémon: Let's Go, what the Poké Ball Plus is and how to buy one, and what we know about the Battle System in Pokémon: Let's Go. By reading through this guide, you should now know what all of the rideable Pokémon are in Pokémon: Let's Go, Eevee and Pikachu!